We don’t often pause to consider the incredible value of a safe, reliable water supply in our everyday lives. But tap water does what no other water can do . 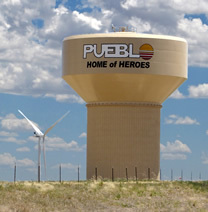 . .
Pueblo’s water system allows us to drink from any public tap with a high assurance of safety. The Board of Water Works protects the health of all in our community by treating water to meet rigorous federal and state water quality standards. The Water Board owns and maintains over 3,700 fire hydrants, providing Pueblo’s Fire Department the reliable water at an adequate pressure they need to protect Pueblo from the ever-present threat of fire, keeping lives and property safe. Tap water is critical to businesses’ day-to-day operation and is often a primary factor in attracting new businesses to Pueblo. Since 1984, the Board of Water Works has contributed over $5.1 million in service to improve Pueblo’s economy. The beauty and recreational opportunities that our parks, golf courses and the Riverwalk Project bring to our lives, helps us realize how valuable our most precious resource really is. View the latest Water Quality Report, or learn about Wise Water Use. 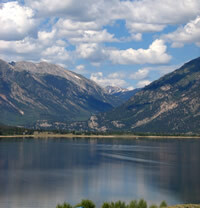 Pueblo's water supply originates high in the Rocky Mountains above Leadville, Colorado. Water from these high mountain watersheds flows into canals, creeks and streams and eventually into the Arkansas River. Our water is then diverted via pipeline from Pueblo Reservoir to the Whitlock Treatment Plant, where it is treated and filtered. The finished water is pumped through a system of transmission mains to various storage tanks and pump stations throughout the city. Water flows from these pump stations through a vast network of approximately 559 miles of water mains to the homes and businesses of Pueblo. This water treatment and distribution process continues 24 hours a day, 365 days a year.